A truth about me: for as long as I can remember, I have always loved canned tuna. I was that little girl in grade school who didn’t realize that bringing canned tuna to lunch wasn’t the “cool” thing to do. And truthfully, even if some part of me did know that on some subconscious level – I don’t think I would have cared. Do you remember those canned tuna salad lunch packages (maybe they’re still around)? They came with tuna, packets of mayo and crushed pickles and crackers. I used to LOVE them. Well, that little girl grew up to be a young tuna lovin’ lady. 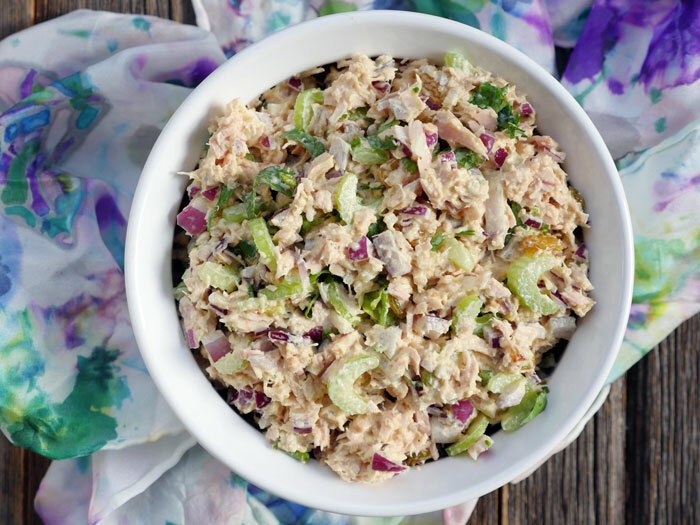 And while I highly encourage you to make my tuna pumpkin patties, tuna croquettes, tuna spaghetti squash noodle casserole or tuna “alfredo” when you have a bit more time – today, I’m sharing a super simple canned tuna recipe: curried tuna salad. 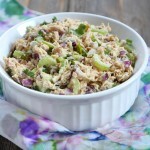 This curried tuna salad is made with crunchy celery and red onion, sweet and tangy bites of plump golden raisins, mayo, cilantro, spices and of course, canned tuna. 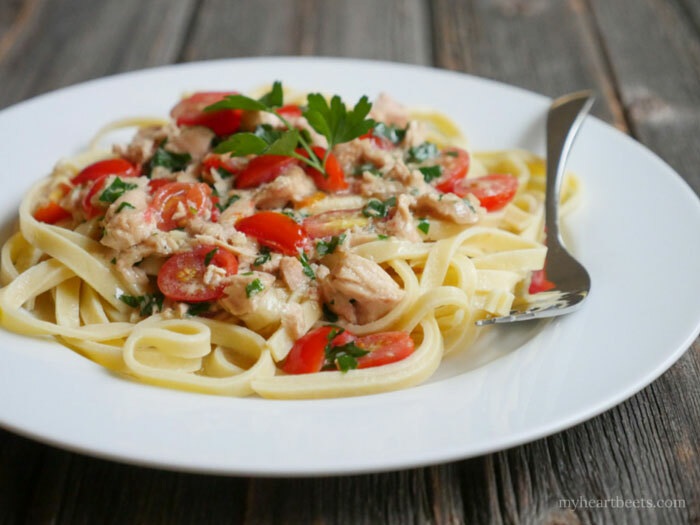 I always use wild caught canned tuna – this brand happens to be my favorite. 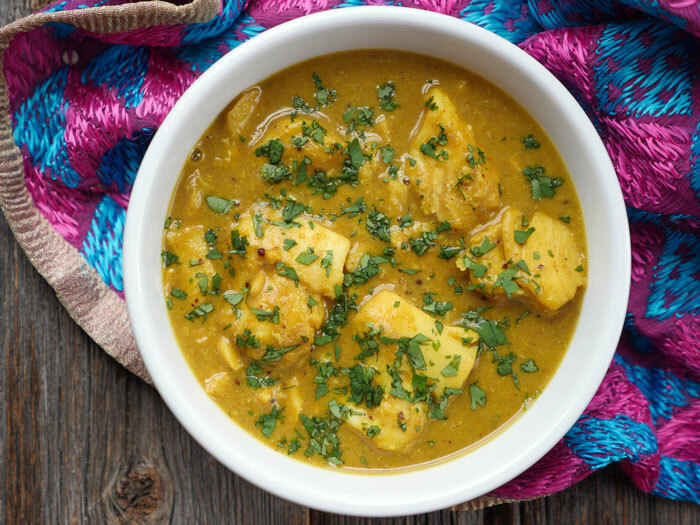 Now that I’m the mother of a newly teething baby, I’m all about simple, healthy recipes that require zero brain power and little energy to make. 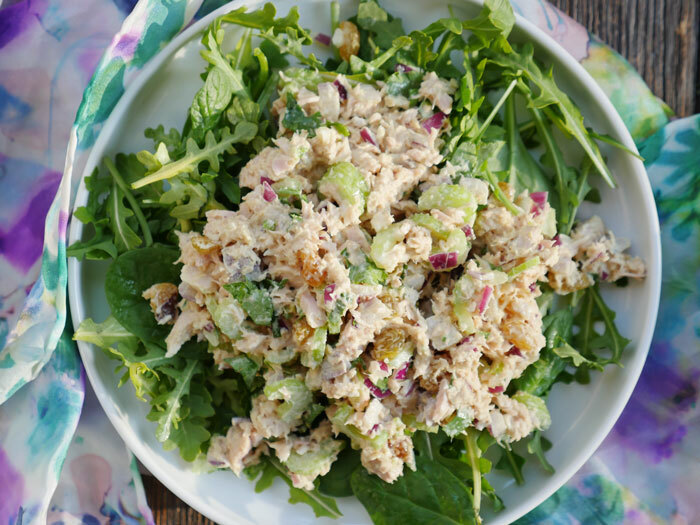 Anyone can make this tuna salad because it takes literally FIVE minutes to throw together. 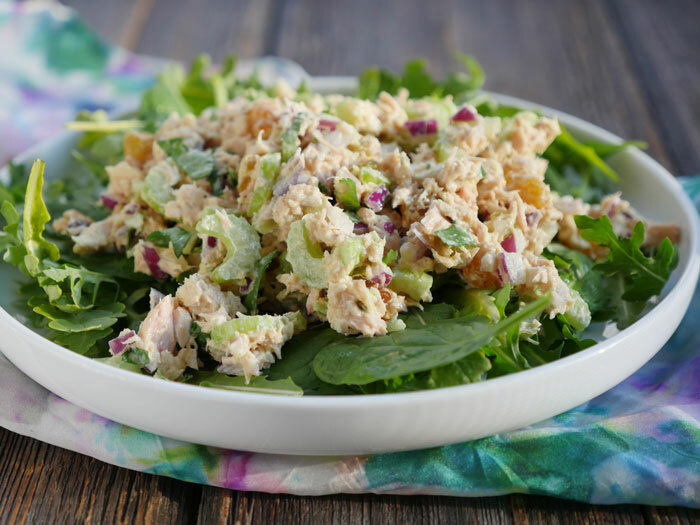 Serve this tuna salad over a big pile of spinach or with some crackers! If you’re feeling ambitious, make my 3-ingredient paleo naan and eat a tuna salad wrap! You know I’m getting zero sleep when I call making my paleo naan “ambitious” lol (because it’s so easy to make too). Anyway, make this, try it, love it and feel good about yourself after you eat it. Serve over greens or with crackers. Yum! I had a can of tuna handy so I made a half recipe; big mistake as I’ll need to make more very soon. 😄 This is the best tuna salad I’ve ever eaten. Now I’m stoked to try your other tuna recipes. Well, not only the tuna; we just finished off the apple butter pumpkin pie and it was wonderful. Thank you for such an easy and delicious pie crust recipe! Patti – I’m so happy to hear that! 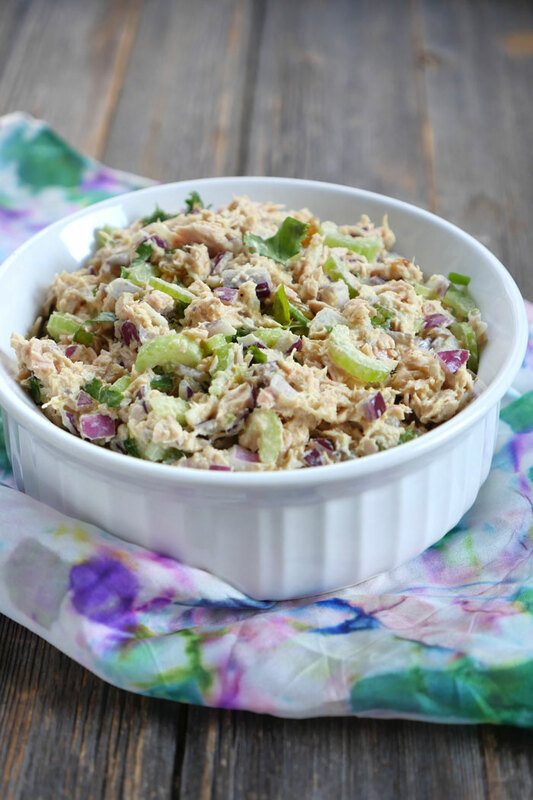 I can’t wait to hear what you think of my other tuna (and non-tuna) recipes! Love tuna! This looks fantastic!! You are adorable, by the way!!! This is my new favorite tuna salad. Kudos to a UVA grad! I’m class of 1997. I will be trying many of your other recipes. Adam, I’m so glad you liked the tuna salad! And great to hear from a UVA grad 🙂 Wahoowa! Let me know what you think of anything else you try! tasty! I ate this wrapped with romaine lettuce, and it was a refreshing summer meal. I made this with chicken and it made a very tasty chicken salad! Thanks for the recipe! 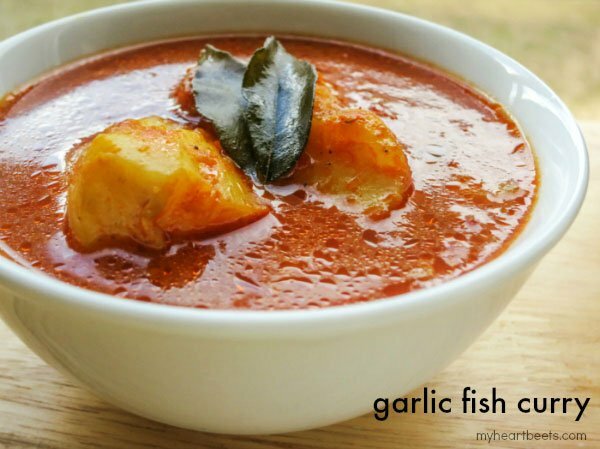 Anu, that sounds delish! I’m so glad you liked it 🙂 I’ll have to try it with sardines sometime!